The 2012 G8 Summit is underway, with leading politicians from eight of the wealthiest countries discussing a number of economic issues. One such issue is how these nations can tackle hunger in developing countries, particularly ones in Africa. Naturally, Twitter is bustling with tweets encouraging leaders to think of those less fortunate, but there is a more visual way to get those tweets aired. Tweet the Street by One International comprises of a small robot pulled along by a truck. It may look like a fancy grass cutter, but actually there are a number of ink jets underneath, which can print messages on a road surface, sort of like a giant printer. This on its own is pretty cool, but One International invited Twitter users to send a 40-character message regarding the summit to the robot’s Twitter account, @OneStreetTweet. From there, the printer pulls tweets from the account and paints on roads--if your tweet is printed, the account will send a photo of it back to you. 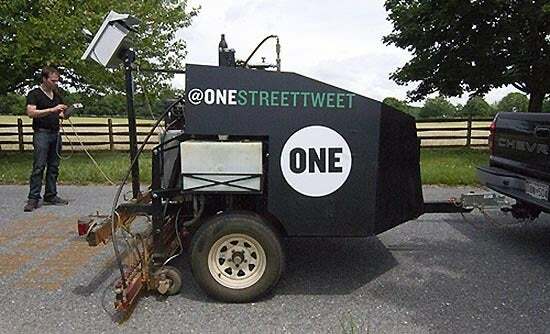 Tweet the Street did a few runs prior to the official summit meeting (which starts today at Camp David in Maryland), with even the likes of Bono taking part. By the sounds of it, the team is getting thousands of tweets out on the streets around nearby Thurmont, Maryland, and in front of The White House in Washington, D.C. Check out the One’s gallery to see the messages and the robot, or if you have an opinion on G8, tweet it.